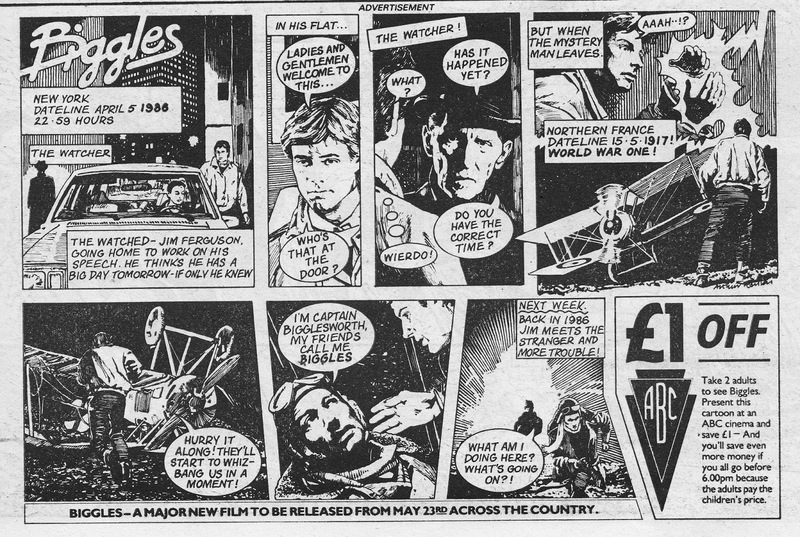 This is the first (of five) half-page comic strips, published weekly, to promote the upcoming BIGGLES movie. Despite following the strip at the time (this appeared in EAGLE cover-dated 3 May 1986) I had absolutely no interest in going to see the movie. Decades later, I suddenly decided I DID want to see it and ordered an el-cheapo copy of the DVD. It's a weird - but not unlikable - mix of WWI daring-do and - of all things - time travel. The producers obviously thought that the original stories wouldn't appeal to a contemporary audience (frankly, they were probably right) but decided to go ahead and make the movie anyway. Maybe they thought BACK TO THE FUTURE had opened-up a whole new market for time travel fare. It's a well put together distraction and its always good to see Peter Cushing, albeit in his final film role (he died in 1994). Biggles himself was played by familiar screen face Neil Dickson, so excellent in the underrated (and seldom-seen) SHE-WOLF OF LONDON. Lensed in the UK, some of the attempts to pass-off London as the States fall spectacularly flat but the flying sequences are well-realised. ABC Cinemas were a venerable British chain which - in a prescient move - expanded into TV in the fifties by securing an ITV franchise. Their lasting contribution to geekdom being THE AVENGERS throughout the sixties. Restructuring shenanigans at the end of the decade saw ABC shoehorned into the new Thames Television operation, serving London during the week and a major supplier of networked fare. The ABC cinema chain, along with its parent Associated British Picture Corporation and Elstree studios, was sold to EMI in the late sixties. With the cinema business brought to its knees by the twin attacks of broadcast TV and home video in the early eighties, Thorn-EMI offloaded its screen entertainment business to Cannon (yup, them) and the ABC chain was rebranded first Cannon and, through various takeovers, subsequently MGM, Virgin, UGC and Cineworld. The brand was briefly revived between 1995 and 2000 when Virgin sold some of the (generally smaller) sites in the ex-MGM portfolio. I remember going to see a film at the resurrected ABC on London's Tottenham Court Road and - for some reason - they'd not only revived the name but also a very ancient piece of on-screen animation which, when it played, was greeted by howls of laughter by the audience. Ha, I was just flicking through a 1986 issue of 2000 AD and saw this advert. I searched for 'Biggles ABC cinema' and found this article. Thanks for the explanation!